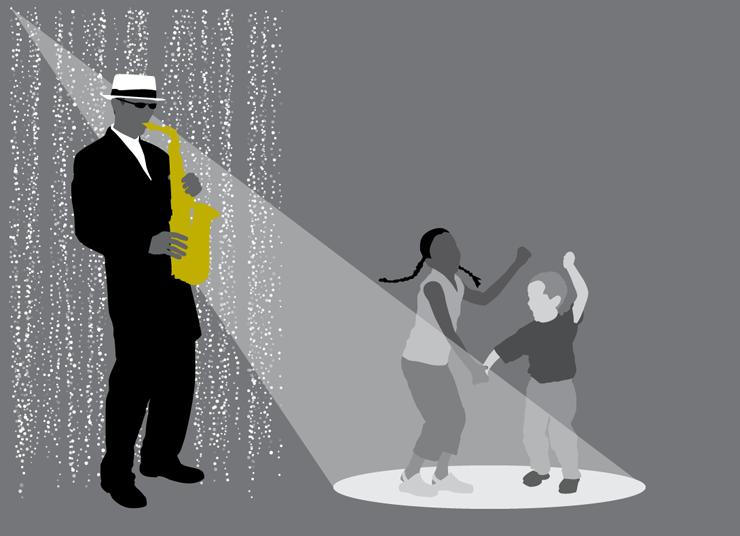 Having noticed the locked stares of youngsters at his appearances, Saxman Slim has developed a 45-minute program for preschools. Slim makes quite a first impression with his hat and glasses getup in front of a silver, sparkly curtain. The children expect a magic show and get one when all that music comes out of a shiny horn with buttons. After a brief demonstration of the operation of the saxophone, hands shoot up to answer TV Theme trivia. Plenty of dancing ensues with the Freeze Dance, the Chicken Dance, and the Bunny Hop. Slim also roams the room asking questions to give the children a chance to talk into the microphone. Rhythm instruments, hats and glasses are then passed out so they can play along with the music while dancing. The show is also appropriate for school-aged children attending during vacations as well as private birthday parties.